Growing cilantro gives you two herbs for the price of one. Although the whole plant is generally referred to as coriander, in the United Sates, the leaves when eaten fresh are referred to as cilantro. The seeds have an entirely different flavor and are called coriander, even in the U.S. Don’t let this confuse you. Whatever you call it, cilantro is a delicious, versitile herb. Fresh cilantro leaves are a popular herb in many ethnic dishes, particularly in India, Mexico, and China. However, it has a love it or hate it flavor. Most people consider the flavor cooling and grassy, but for some reason, many people experience it as soapy. Even Julia Child hated cilantro. The seeds can be used whole or ground and are frequently used in curries, pickles, and sausages. Their flavor is more of a musky floral with a hint of citrus brightness. It is difficult to try and explain flavors in words. Why not give both cilantro and coriander a taste, before judging them? Coriander is in the carrot family and has the familiar flat, umbel flowers. Leaves - The leaves at the base of the plant are fan shaped and resemble a pinked parsley leaf. As the stem grows, the leaves become much thinner and feathery. Flowers - The flowers grow in umbels and are usually white, but some varieties are pink. The seed is round and hard. Coriander favors cool weather and grows best in partial shade. It can handle more sun in early spring and in the fall, especially if kept moist. Cilantro is an annual. It will quickly bolt to seed when days lengthen and the temperatures rise. You should be able to start picking leaves within 50 - 55 days of starting seed. The seeds will take longer, usually about 100 days, to mature and dry. Very often you will find seed that is simple labeled "Cilantro". However, as the herb becomes more popular, there are a few named varieties that are worth looking for. "Santo" and "Marino" are both very flavorful and slow to bolt. Both coriander and cilantro are versatile herbs. You can harvest cilantro leaves once the plants are about 6 inches tall. Pinch portions of the upper stem and the plants should branch out and grow even more leaves. If your plants should go to flower, don’t waste them. Even the flowers are flavorful and edible. Cilantro is very delicate and should be used fresh, at the end of cooking. The best way to store cilantro for future use is by freezing. The seeds can be harvested green or you can wait until they have dried. The taste is a bit fresher in the green stage. You can store them in the refrigerator for several weeks or freeze them the same way you would the leaves. You can also wait until most of the seeds have dried and turned brown. Cut off the entire seed head and store in a paper bag until the seeds have come loose. Then store in an air tight container and don’t grind them until you need to use them. The seeds are staples of curries and ethnic stews. They are frequently paired with cumin, but experiment. Coriander works with everything from beans to pork, fruits to vodka. Soil: A neutral soil pH of 6.2 to 6.8 is best, but cilantro will grow in just about any rich soil. Since it grows so fast, give is lots of organic matter. Sowing: It is becoming more common to find seedlings of cilantro, but it is often started from seed. You can start seed indoors, 4 – 6 weeks before your last frost date, but cilantro doesn’t transplant well. It is just as easy to wait and direct seed 1 – 2 weeks before your last frost date. Succession plant a new batch every couple of weeks, to prolong your harvest and take advantage of its short season. Cilantro/Coriander seeds are actually fruits that contain 2 or more seeds. That means you will get more than one plant from each seed. You can either thin the seedlings or let them all grow. They don’t live long enough to squeeze each other out. Although cilantro is a cool weather herb, it is still frost sensitive. Keep the row covers handy and protect your plants if extreme weather is predicted. 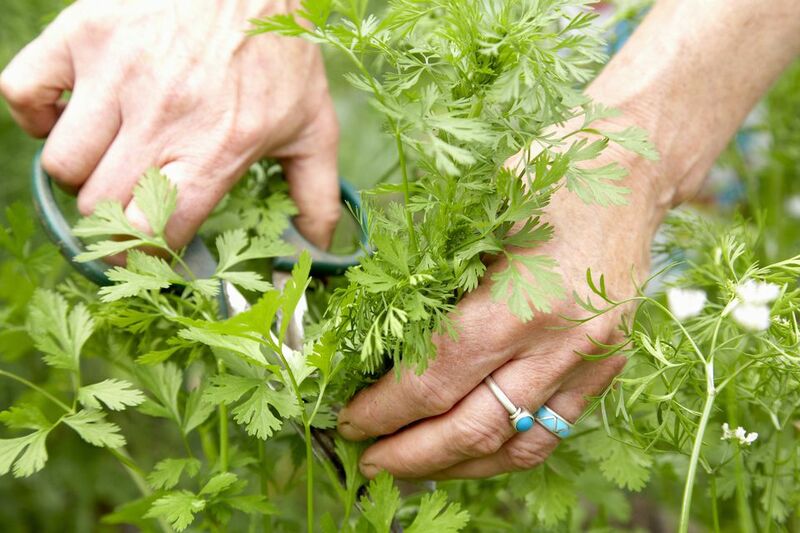 Gardeners in USDA Zones 8 and up will have better luck with a fall sowing of cilantro. You can even succession sow into winter. Even cool season gardeners can start seed in late summer, to harvest up until frost. The biggest challenge growing cilantro is that it seems to bolt the minute it’s ready to start being harvested. That’s because cilantro responds to the length of daylight. It will bide its time, during the short days of spring or fall, but the long days of summer signal it to set flowers and go to seed. You can stall it for a little while, by shading it, keeping it well watered, and harvesting leaves often, but it will eventually go to seed. The only way around this summer bolting is to succession plant often. You will need to pamper the seed by keeping the soil moist and cool, or it might not germinate at all. These plants will still go to seed, but if you stagger your plantings, you should get a few good harvests from each. It might be easier to start seed indoors, in controlled conditions. Just don’t let the plants become too large, because cilantro doesn’t like to have its root system disturbed and will adapt better if it is still a young seedling. The plants aren’t around long enough for diseases to be a problem. You may get aphids or whiteflies, if the plants are crowded or stressed. But expect your plants to be virtually problem free. Even deer don’t like cilantro.